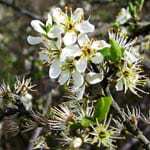 Blackthorn is a very thorny shrub. It makes a good hedgerow plant (together with hawthorn, gorse and holly) as it creates impenetrable thickets and therefore provides good protection for a whole range of wildlife. Many plants grow beneath it as they are protected there from grazing animals. Birds build their nests among its branches and small mammals like hedgehogs find safe shelter below its dense canopy. The threatened Black Hairstreak (Satyrium pruni) butterfly lays its eggs in thickets of Blackthorn where they overwinter. The caterpillars emerge in spring. 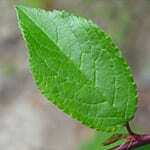 The leaves are small and slender (widest above halfway), alternate and oval in shape, tapering to a point at the tip. They are a dull, dark – sometimes sticky above and hairy on the veins beneath. The leaves open after the flowers. The flowers are white and appear early – between March and May – before the leaves. They have 5 petals, either singularly or in pairs on the stems and often occur in huge numbers. They are one of the first sources of nectar and pollen for insects that emerge early in the spring. 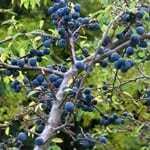 The fruits, called sloes, are bluish-black ‘drupes’, often with a waxy coating. The fruit is round, between 1 and 1.5cm long, and contains one large stone and, normally, not much flesh. They are rich in vitamin C, but very sour to taste. They sometimes sweeten after the first frost and remain for a long time on the plant – good winter food for birds and mammals. The twigs are black and spiny with leaf buds along the spines, which are formed from shoots. The wood is dense and hard-wearing. It was traditionally used for making tool parts and walking sticks. It makes good firewood. 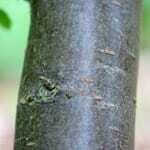 When the plant is old then the bark becomes very dark – almost black. 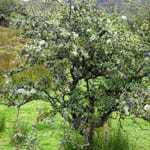 Blackthorn grows in hedges, on rocks and in woodland. As a shrub it grows up to 3m in height. It thrives in full sun and grows in all kinds of soil, although it prefers a soil rich in lime. The only soil it doesn’t like is very acid – like peat, where it will not grow. 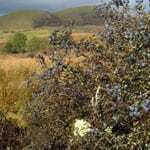 Blackthorn protects soil from erosion and is used as a barrier against the wind.